FareHarbor is an easy-to-use and powerful online booking solution for tour and activity companies. Using the Smartwaiver API, the good folks at FareHarbor have whipped up a seamless waiver signing integration into their software. If you're a FareHarbor client and have things configured on the backend, your customers will be able to sign your smart waiver as part of the online booking process and you will be able to track and manage the signed waivers within your FareHarbor account. 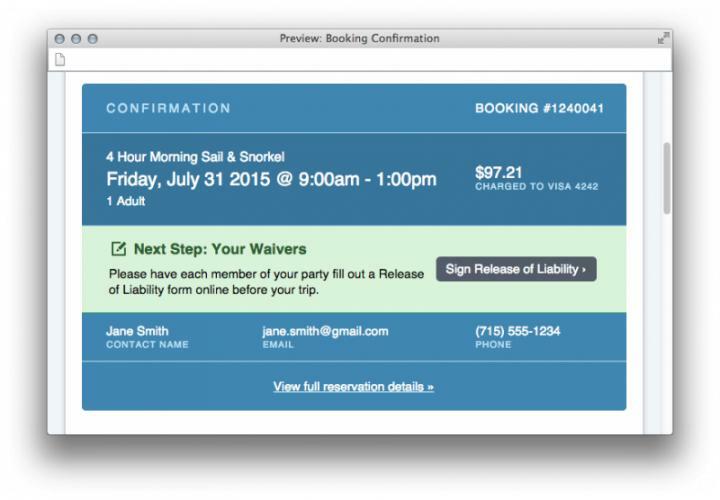 Immediately after a customer books an activity online they will receive a confirmation email that directs them to sign the waiver as a next step in the booking process. Once signed, the document is automatically added to the customer’s booking invoice. On the FareHarbor manifest you will be able to see whether the waiver has been signed or not, as well as the number of people listed on the participant’s waiver. You will also have the option of opening the signed document as a PDF or view it in the Smartwaiver Waiver Console. For more information on how to set up the integration, head on over to the FareHarbor Support page. Note: In order to use the integration, an active FareHarbor and Smartwaiver account are required.